Hydrotherapy is water based exercise normally supervised by a physiotherapist that takes place in a heated pool and can be used for a large number of conditions such as; chronic pain, fibromyalgia, arthritis like conditions, and as pre and post-surgical rehabilitation. Benefits of Hydrotherapy include: pain relief, strengthening of muscles, increased range of motion, improved balance and circulation. Hydrotherapy is particularly useful as the warmth of the water aids in the extensibility of soft tissues. This include muscles, fascia, ligaments and tendons. It also helps with warming the fluid in the joint spaces. This can be likened to cold oil being thick and viscous before warming up and becoming thin and easy to move. Another benefit of hydrotherapy over other types of exercise is the level of weight going through joints of the lower limb. The interesting thing about being in the water is it progressively decreases the amount of weight going through joints as you get further submerged. This essentially allows muscles to be exercised preferentially whilst giving joints a reprieve. In the case of osteoarthritis (OA) numerous studies have been conducted to demonstrate the effectiveness of hydrotherapy as a non-surgical technique to reduced pain levels. For these patients, overwhelmingly the results are positive. A systemic review out of Adelaide in 2003 showed patients with OA had significantly reduced pain and increased function after completing 6 weeks of hydrotherapy. 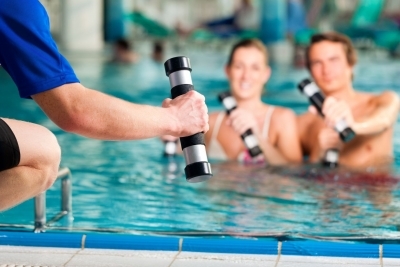 This study shows that hydrotherapy is a useful method to increase activity without stirring up joints. With chronic pain; hydrotherapy has strong evidence for benefits for patients with back pain and other pain conditions like fibromyalgia. The outcomes of a systemic review in 2008, which looks at lots of studies on the same topic, found that hydrotherapy decreased tender spots, and pain levels generally. Furthermore there was increased function and psychological impact. So even though it may be cold outside, the water is always warm and hydrotherapy continues. Whether for exercise or pain relief hydrotherapy is a wonderful option, talk to your physiotherapist if this is an option for you. The only thing missing is a Pina colada. Article written by Healthfocus Physiotherapist Alex Wright. To book an appointment with Alex, contact Healthfocus Physiotherapy Wodonga.